The Vegan Box April beauty box was a lovely surprise, packed with a number of full and trial sized products. All of the brands are based in Australia, and everything in the box is always vegan and cruelty free! The Vegan Box beauty box only comes out once every two months and it costs more than the other beauty subscription boxes out there, but that means that the value of each box is higher and from what I can tell they are more likely to include full sized products. I have very fair skin and I was very excited to try this tanning moisturiser. I applied it every evening for four days, and I actually didn’t see any difference in the depth of my skin colour. I do love how it makes my skin feel though – and the scent – so I will definitely continue to use it. Have you tried this tanning moisturiser? Do you have any tips for me to get better results? I’d love to hear from you in the comments below! This tinted lip balm smells so good (it’s minty) and the colour is a really natural red with a *tiny* bit of shimmer. It lasts like a lip balm, and reapplication is a breeze. I am a big fan of oils so I was very happy to see this bottle of Jojoba in the box. The Jojoba Company’s Jojoba oil is quite thick compared to some others I’ve tried, and it absorbs into the skin more readily. I would definitely repurchase this. Google uses for Jojoba oil, or check out my post on oils for skincare. If you aren’t already a fan of oils, I promise they will change your life. I have always had dry skin (except when I’m in super high humidity, which I love) and I always need hand creams, so this inclusion was a nice surprise as well. I absolutely adore the scent of this one, which is a blend of patchouli, mandarin, Roman chamomile and geranium. I do find that it doesn’t absorb straight away, but take an extra 30 seconds to massage it in and most of the slide should dissapear. 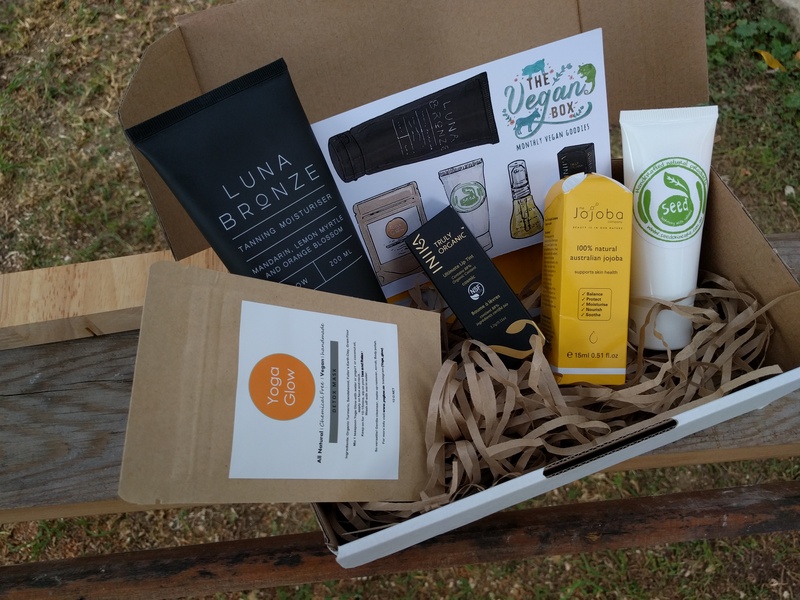 The Vegan Box beauty and snack boxes are available from their website. They only ship to certain countries, so if you’re outside of Australia send the lovely team an email at help@theveganbox.com to see if their boxes can be shipped to you. Did you get the April beauty box? I’d love to hear your thoughts on the goodies in the comments below! ~ This box was provided to me for review purposes, however all opinions within this review are my own, and true to my experience. I will always be honest about how a product performs regardless of whether the product was supplied or purchased.